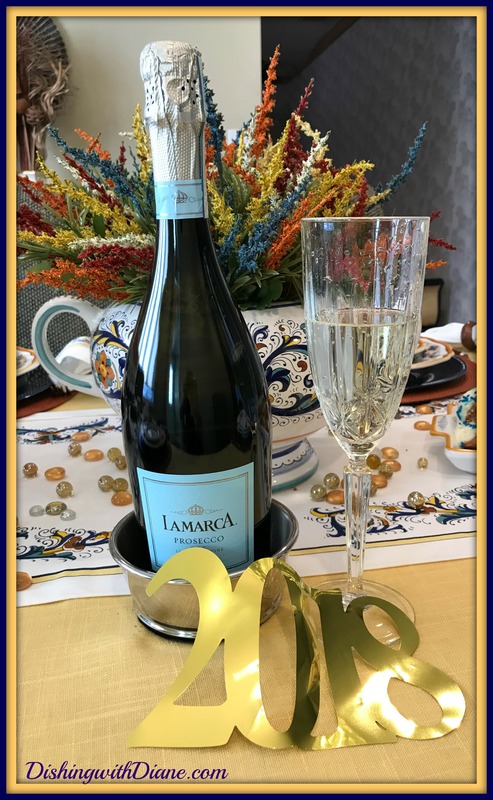 I absolutely LOVE sharing my tablescapes, stories and recipes with all of you. It has been a wonderful experience for me and I have made so many new friends over the three years. You have all become a second family to me. I want to thank each and every one of you for becoming members and showing the love and support for this blog. 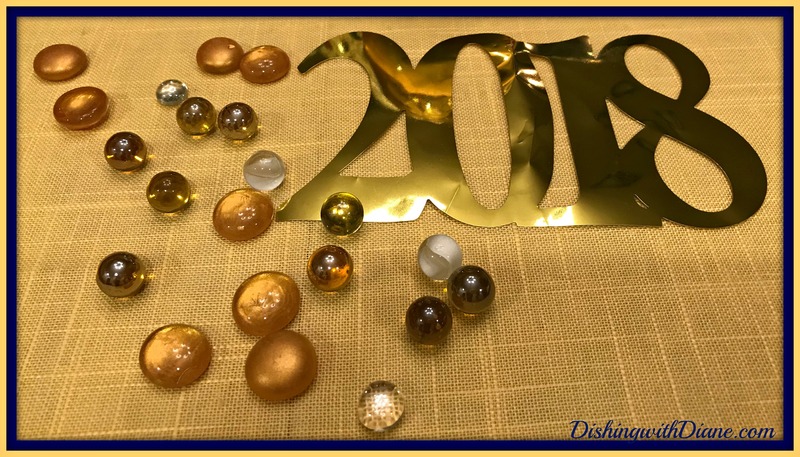 Please continue to ask your family and friends to follow, like, share and join DishingwithDiane.com, as we continue to grow. And continue to send me your comments, I love hearing from you. 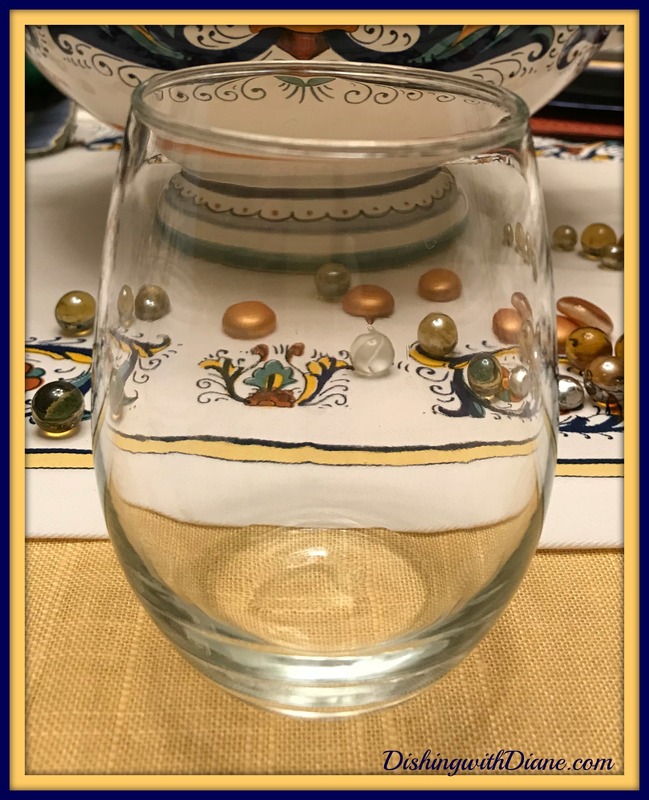 I hope along our journey together, I have inspired you to try a new recipe or given you an idea for you to create a tablescape at home. 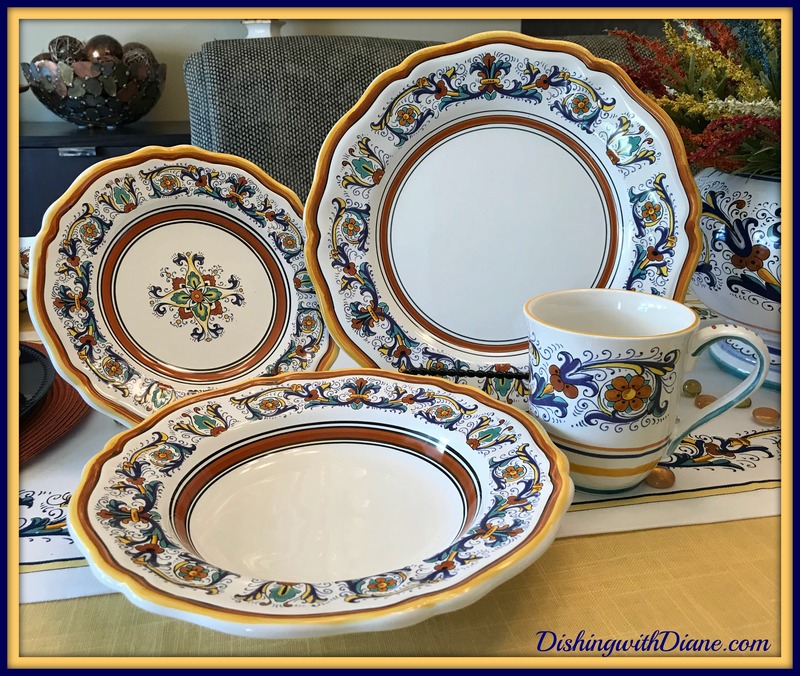 For this anniversary tablescape I wanted to feature my Italian Deruta dishes. Both my husband and my son bought me new pieces for Christmas to add to my collection and I can’t wait to use them. Let’s start with the tablecloth. I am using a sunflower gold tablecloth to blend with the rim of the dish. I am adding something that I don’t normally use on my tables and that is a table runner. For this particular pattern, I thought the table runner pulled everything together nicely. The dishes are one of my favorites, Nova Deruta. It is an earthenware dish with scalloped edges with a cream background and a sunflower gold & rust rim. The intricate pattern on the dish feature vibrant colors of navy, turquoise, sunflower and rust. 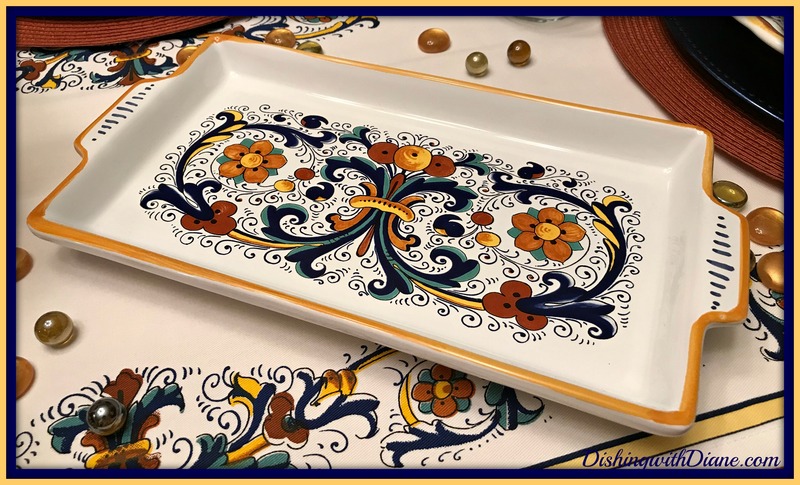 While doing some research about the dishes from Italy, I discovered that this design also originates from a fresco made by a Renaissance master, “Il Perugino” created the frescoes containing the dominant motif of this pattern. If you travel to Italy you will be able to see them in the “Logge del Cambio” in Perugia. Deruta majolica artists later adapted the motif to the ceramic art. 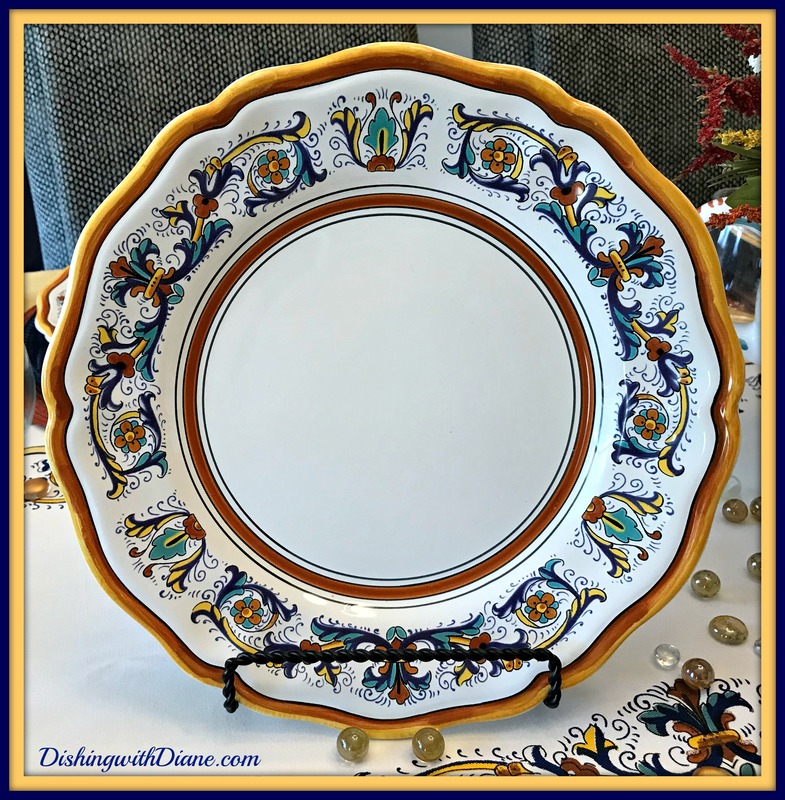 The dinner plate has a scalloped edge and a border in sunflower and rust with the fresco design around the rim and a cream center. 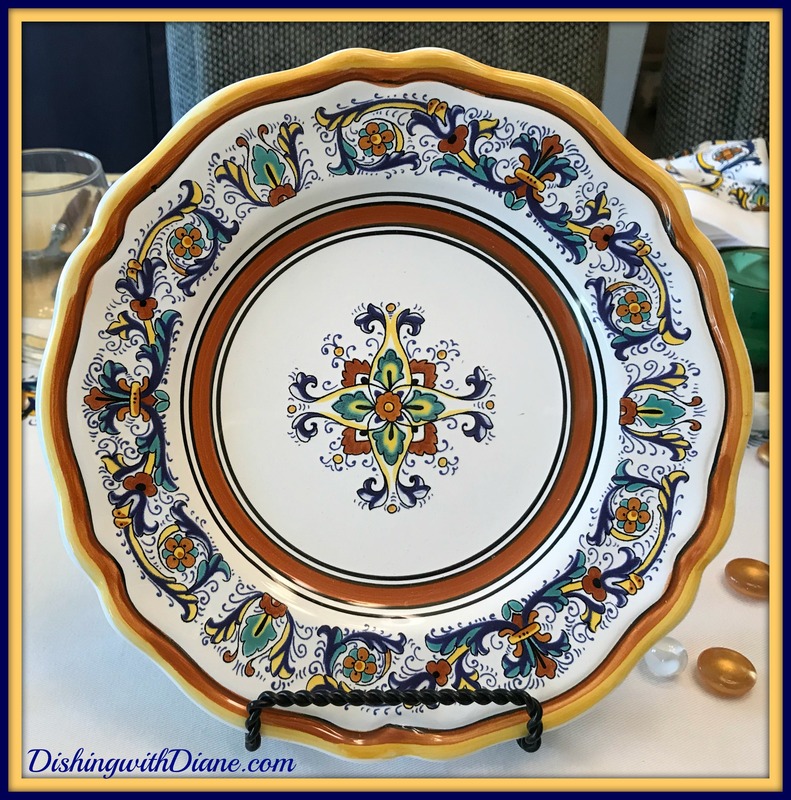 The salad plate also has the scalloped edge with the same design as the dinner plate but the center has the design of the fresco. I chose two colors from the plate for the placemats and chargers. 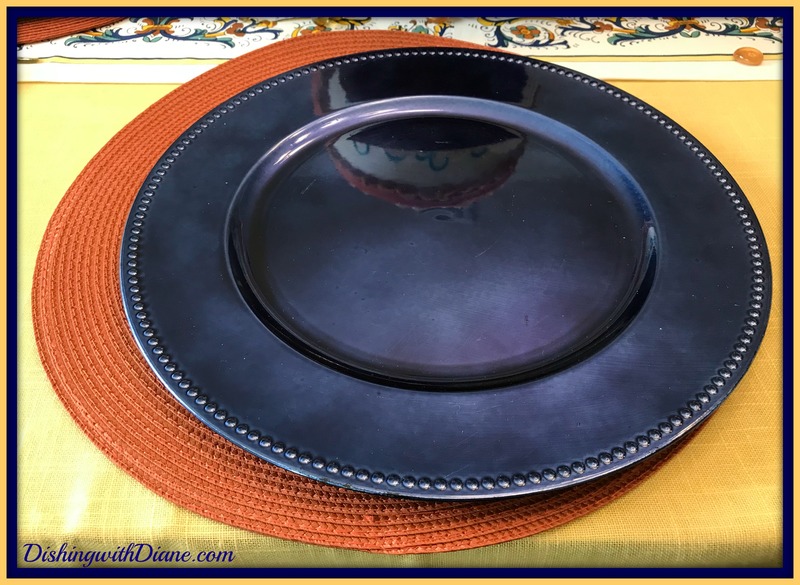 Rust woven placemats and navy beaded chargers. (With the lighting the placemat looks orange but it is a deep rust). 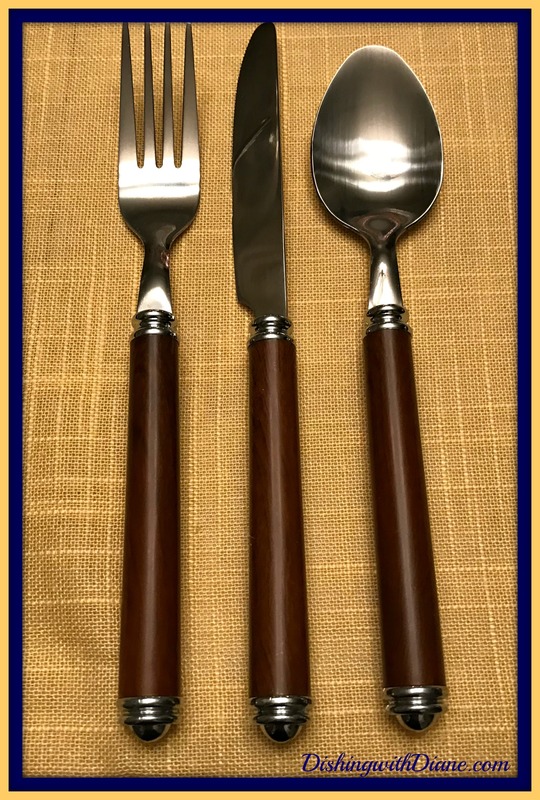 These dishes always give me a rustic feel of Tuscany, so I am using wooden flatware to keep the rustic theme going. 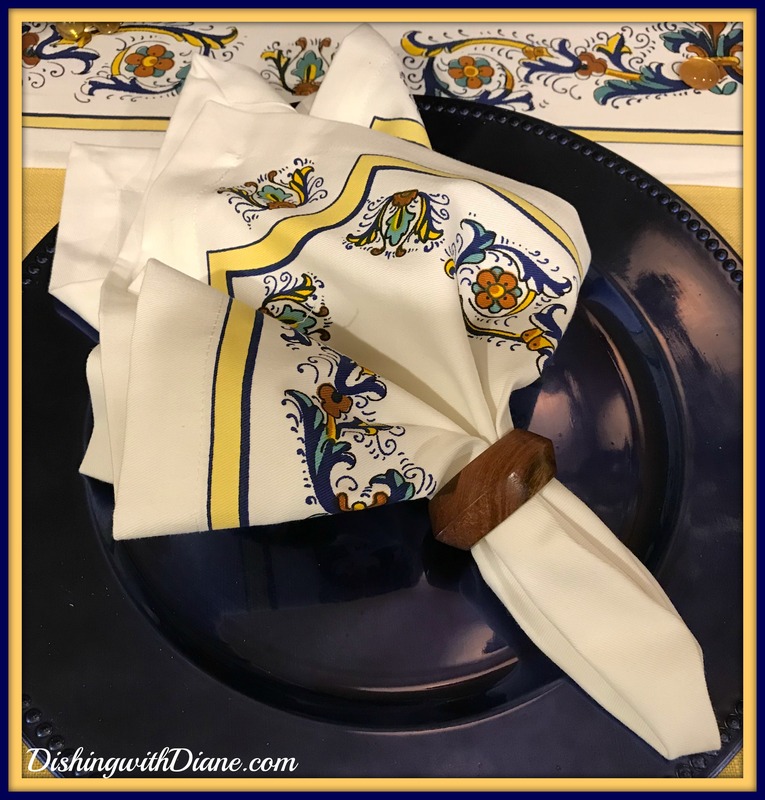 Instead of a solid color napkin from a color on the plate, I chose the Deruta napkins to match the set and wooden napkin rings. The glasses will be simple. 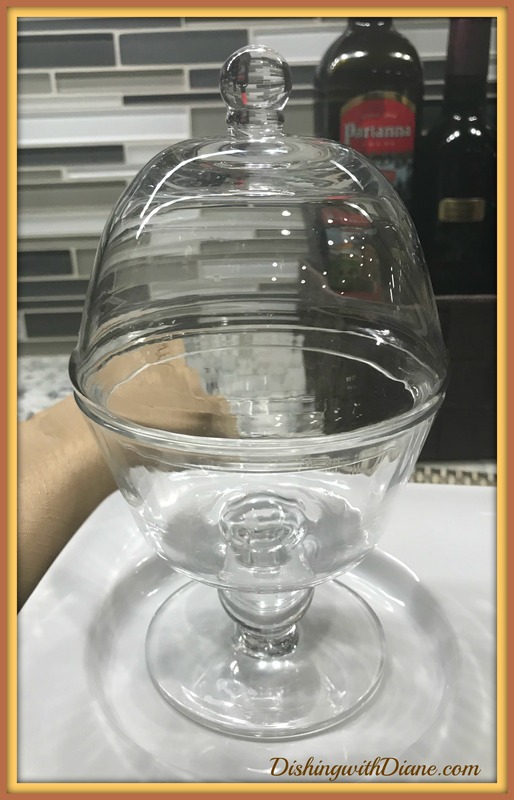 My clear stemless wine glasses. 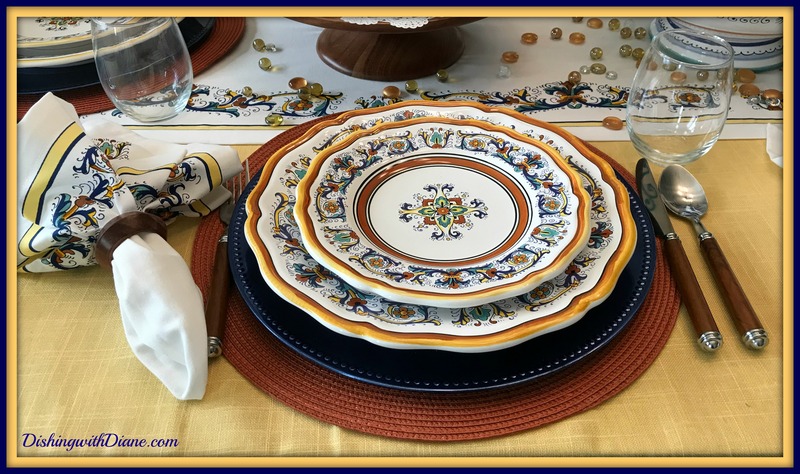 I didn’t want colored glassware to interfere with the intricate pattern on both the dishes and table runner. The new piece that Bob bought me is the soup tureen. I absolutely LOVE it. 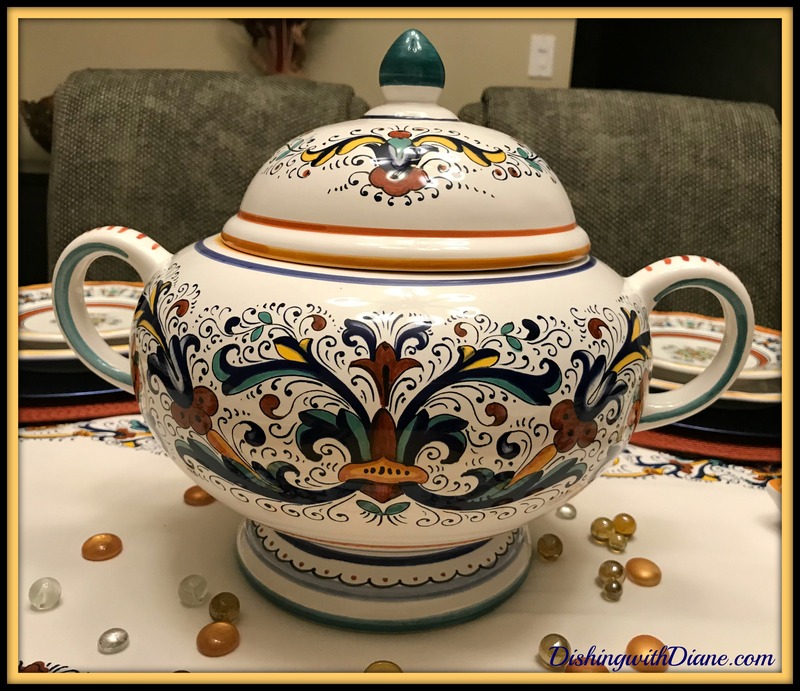 Not many people can fall in love with a soup tureen, but I can. I didn’t want to make soup for the occasion, so I am going to use this piece as my centerpiece. My son bought me the demitasse cups for Christmas and we will use those later with dessert. Speaking of which, what is a celebration without a cake? This year I gave the bakery a challenge when I gave them a photo of the plate and told them I wanted to have all the colors of the plate on the cake. I think they did a great job. The cake is a marble cake with a layer of cannoli and a layer of chocolate pudding. 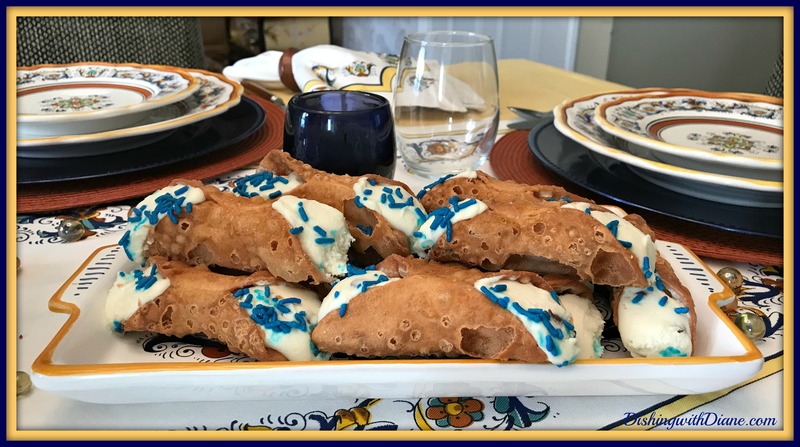 I had to buy some additional mini cannolis when I picked up the cake. I couldn’t resist; the smell of the bakery got to me. I will serve these on one of my Deruta serving trays. 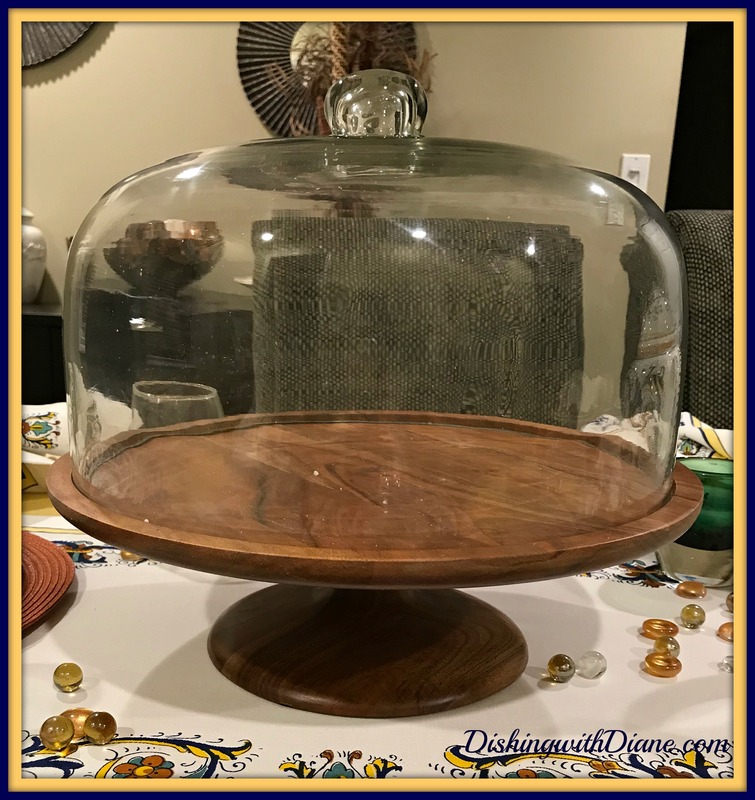 Since I am going rustic, I am using my Acacia wood pedestal cake stand (this comes with a very large dome). I ordered it from Crate and Barrel. I wish you could see the detail of the wood in person. 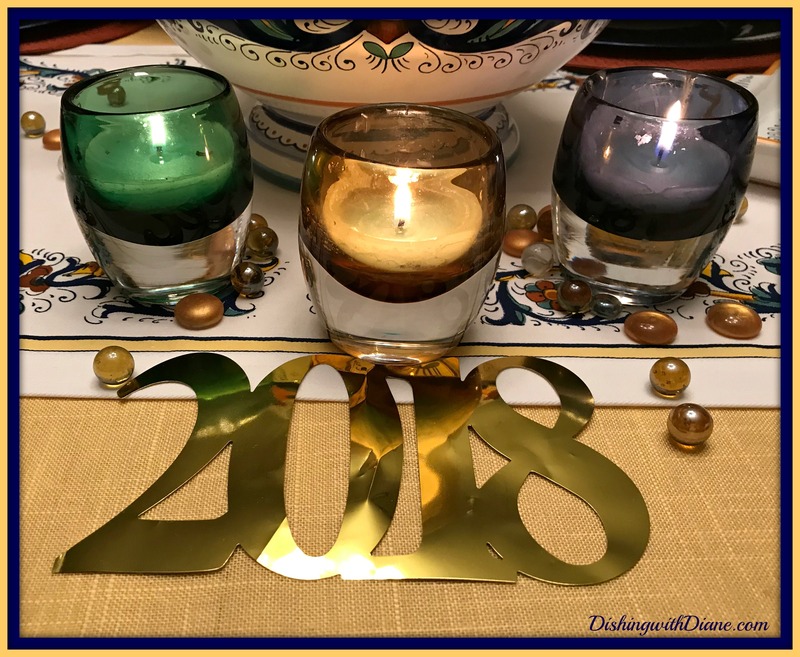 Of course there must be candles and I am using glass votives in shades of emerald, gold and navy. 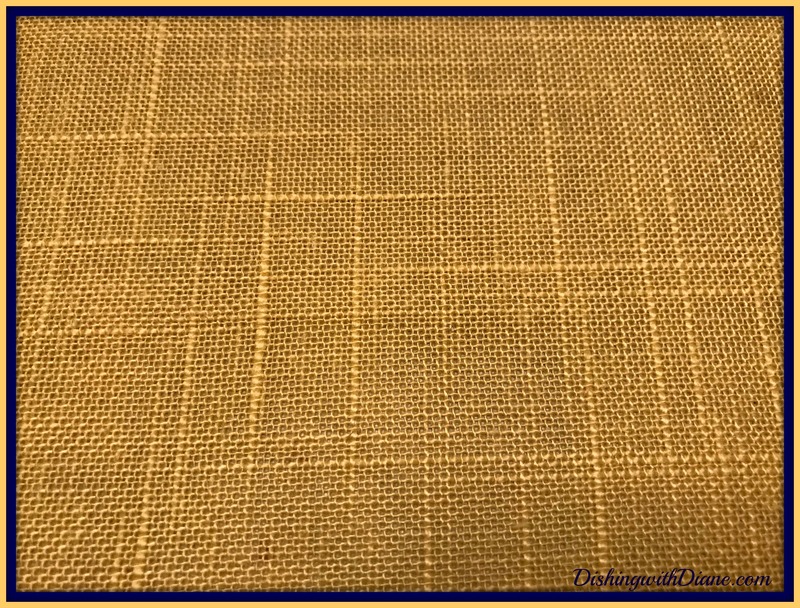 A few pieces of golden glass table scatter on the runner and we are almost done except for the centerpiece. I told you it would be the soup tureen, but it had to have something added. 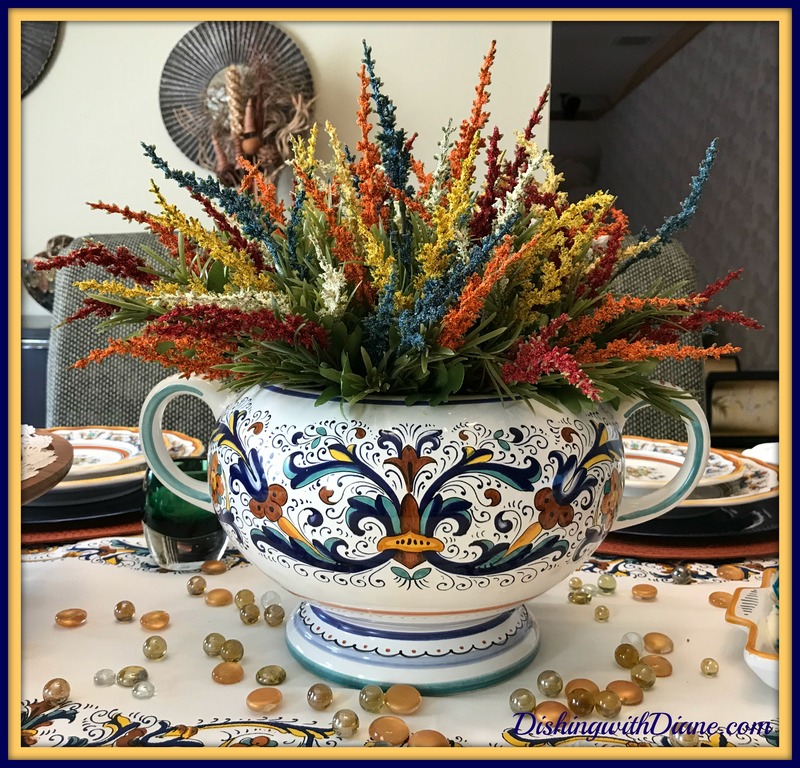 At first, I thought I would fill the tureen with hydrangea but that didn’t do it for me once I saw the hydrangea in the tureen. Still searching, I came across these little heather floral picks in Michael’s Arts and Crafts. I dug through the basket to search for colors that would coordinate with my tureen; came home made the arrangement and now I am a happy girl. 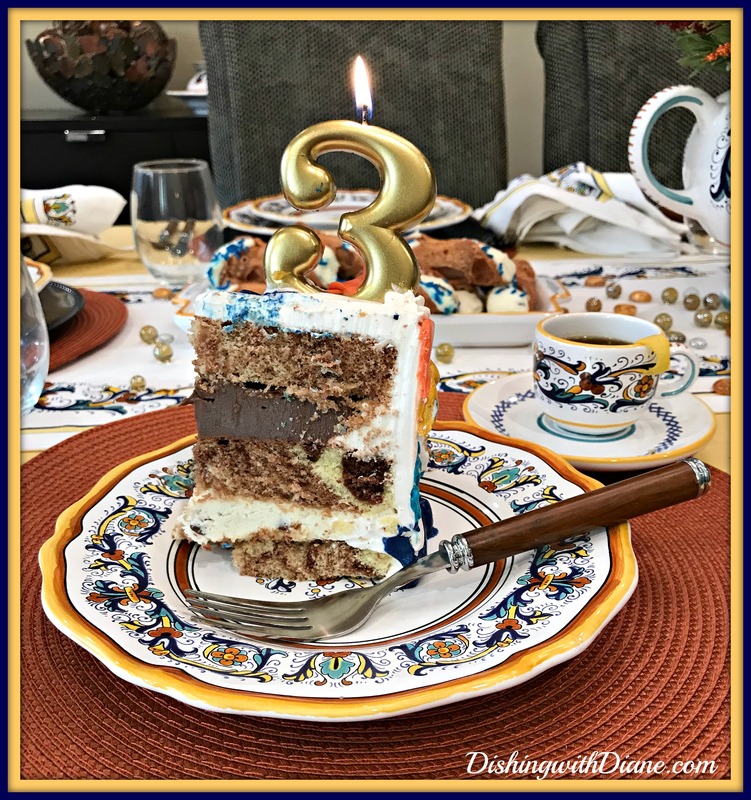 and some demitasse with anisette and our 3rd Blogiversary occasion cake. We are ready to celebrate. 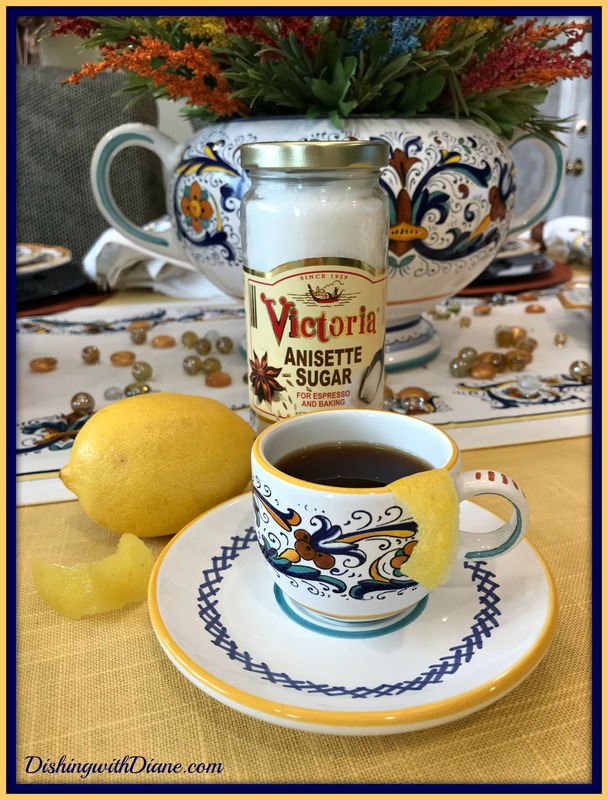 Just a note, I always use a fresh lemon peel for the rim of the cup and anisette sugar in demitasse coffee just like grandma did. I have to share one other thing about my day of celebration. 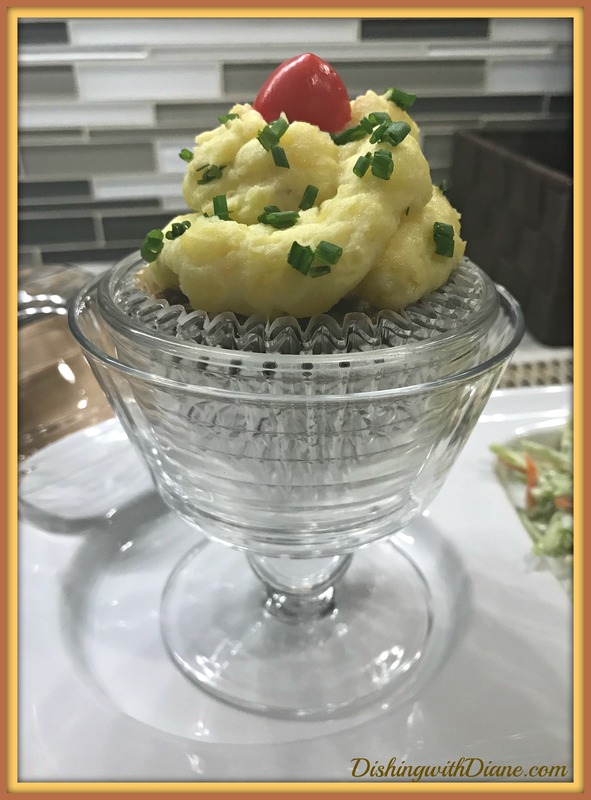 This afternoon, I surprised Bob with cupcakes for an early lunch, but this time the cupcakes were turkey meatloaf cupcakes with mashed potato frosting, chive sprinkles and a grape tomato as the cherry on top. 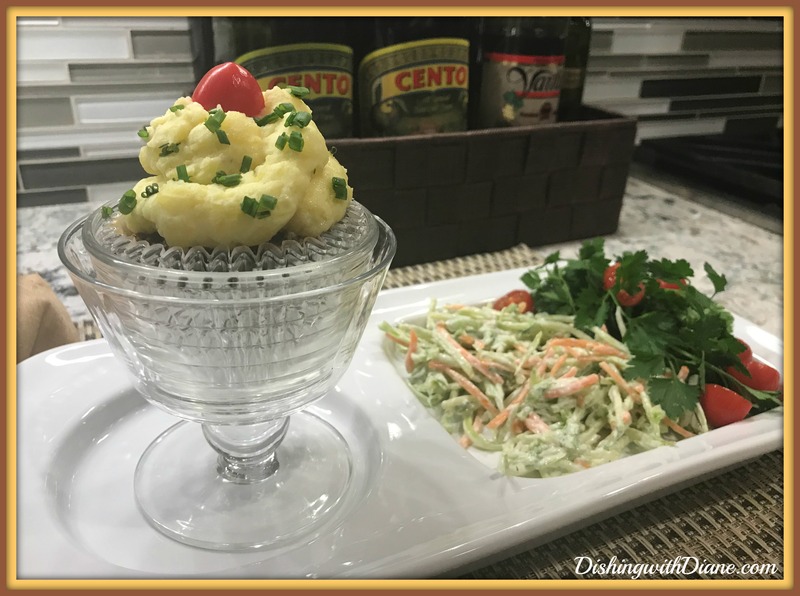 Served in a cupcake holder with broccoli slaw as a side dish. I have been celebrating all day. It has truly been a pleasure for me to share three years together with all of you. 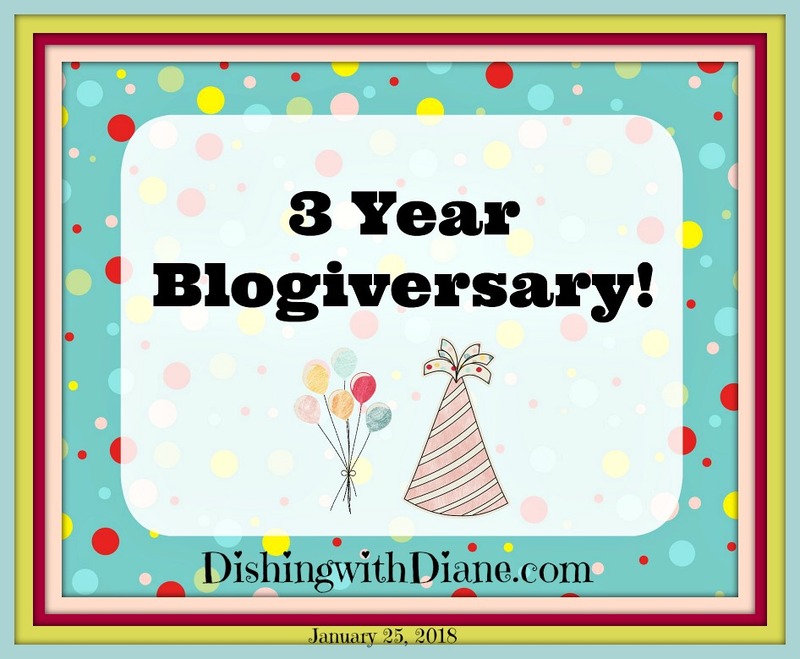 Spread the word about DishingwithDiane and continue to help me get new members. We have a lot more fun ahead. Put the potatoes and garlic in a large pot with salt and enough water to cover; bring to a boil. Cover and reduce heat; simmer for 20 minutes or until potatoes are tender. Drain and return potatoes and garlic to pan. Add sour cream and remaining ingredients. Using a masher or blender, mash until smooth. Season with salt and pepper to taste. Meanwhile, preheat the oven to 350°. Line a muffin tin with foil liners. In a large bowl, mix the turkey, zucchini, onion, breadcrumbs, ketchup, egg, and salt. Place meatloaf mixture into muffin tins filling them to the top, making sure they are flat at the top. Bake uncovered for 18-20 minutes or until cooked through. Remove from tins and place onto a baking dish. 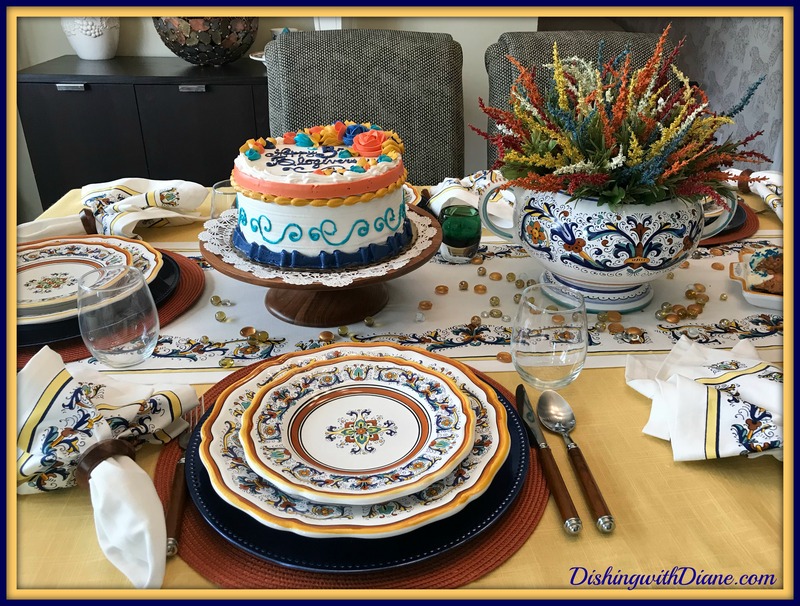 This entry was posted in Dishing with Diane Blogiversary, Turkey on January 25, 2018 by aries041158. 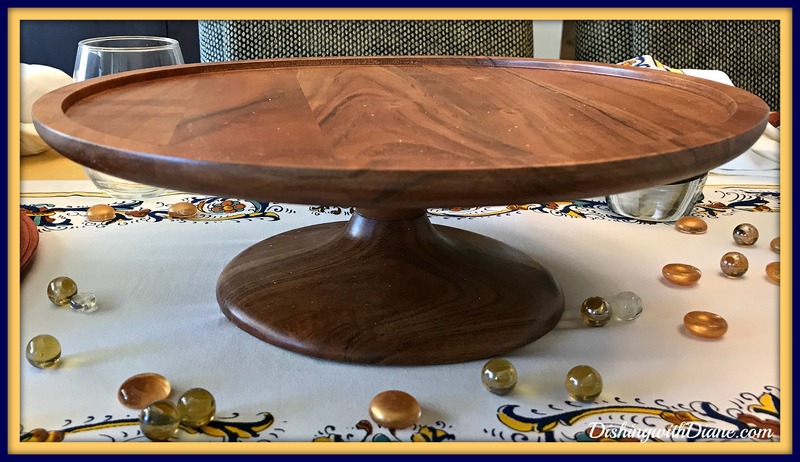 Oh, Diane, I am crazy about this table! I LOVE your dish set and you have highlighted it perfectly!! And your centerpiece takes centerpieces to a whole new level: how perfect to find flower picks that match the colors in your dishes so well! Your setting is so colorful it could easily be a table in a Tuscan cafe! Bravo!! 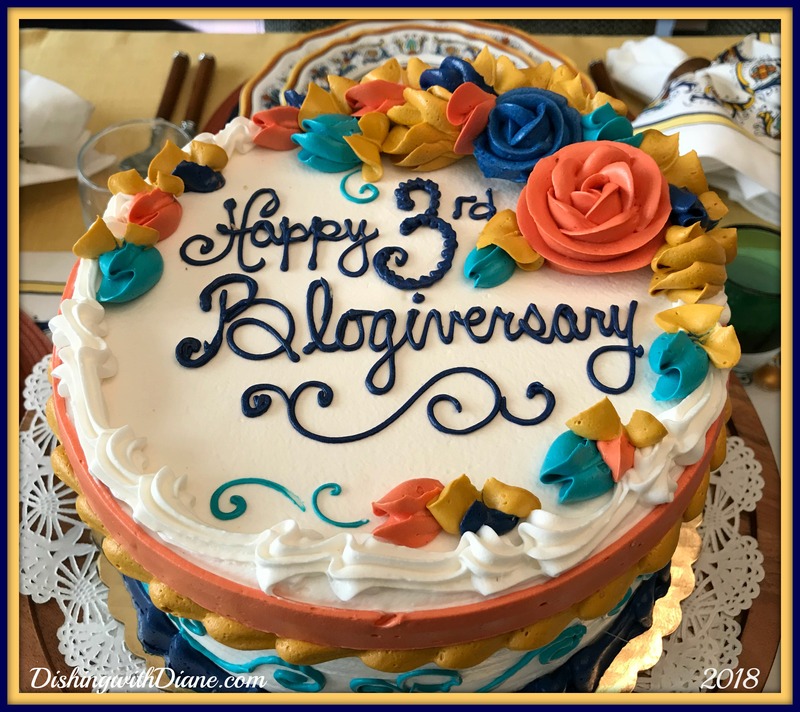 Oh, and HAPPY 3RD BLOGIVERSARY!!!!!!!! Just LOVELY! 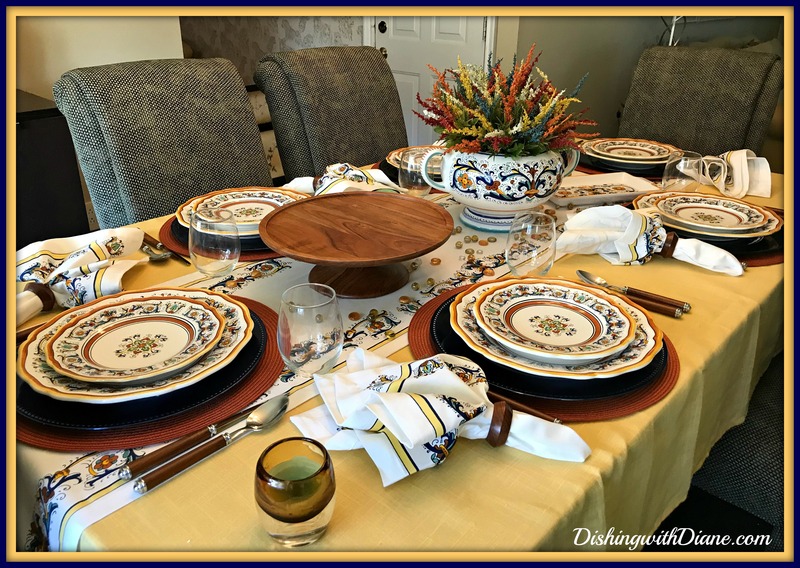 Your tablescapes are always inspiring and inviting. Thanks for sharing. Thank you Contessa, I am so glad that you are enjoying reading the blog. It is my pleasure to share my passion with so many and write the blog. I look forward to all the comments.Thank you for being a member. Thank you Jeanne. Do you believe, three years already? 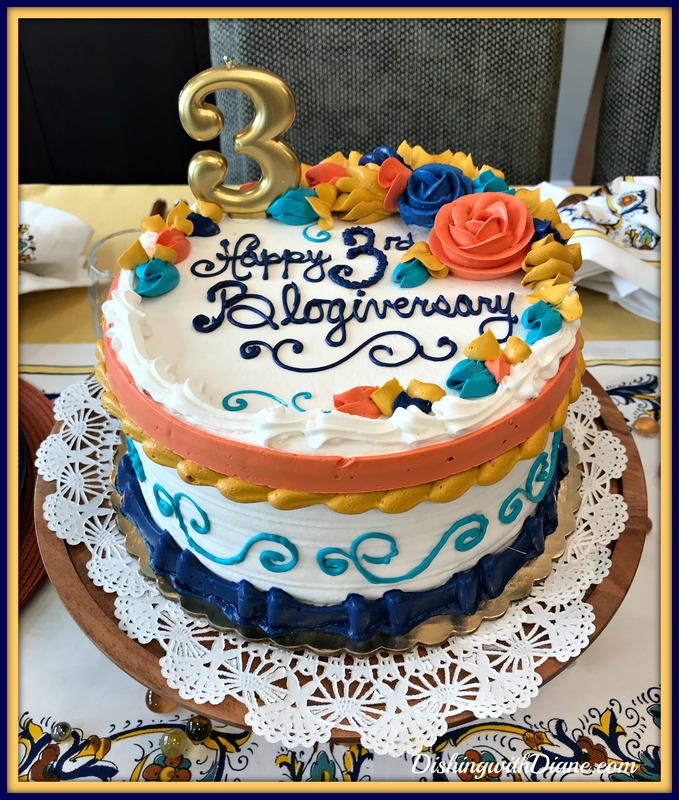 Time is just flying by and I am having so much fun with the blog. Talk soon.